One of the many things we teach at our Sign Magic Workshop is how we paint our signs and projects. Watching it and then practicing under our watchful eye is the best way to learn. The second best way is to watch how we do it. 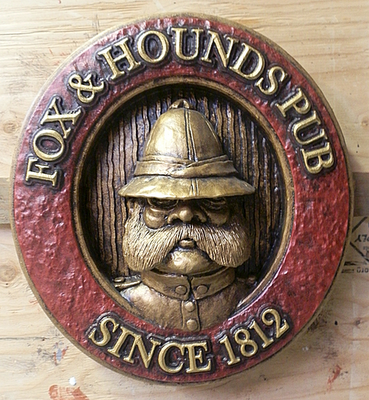 The sign I demonstrate on is the Fox & Hounds Pub founder. This is a single color glaze, where most of ours involve a buildup of two or three (or more) colors. But with the magic of video I'll show just how fast it all happens. And finally here's some clearer pics of the sign after I finished glazing it and then adding the last paint on the letters. As quick as that the magic happens and the sign is done! Right-o on with it chaps!